Fans of cricket, especially of Sachin Tendulkar, must watch the biographical film made on the legend. 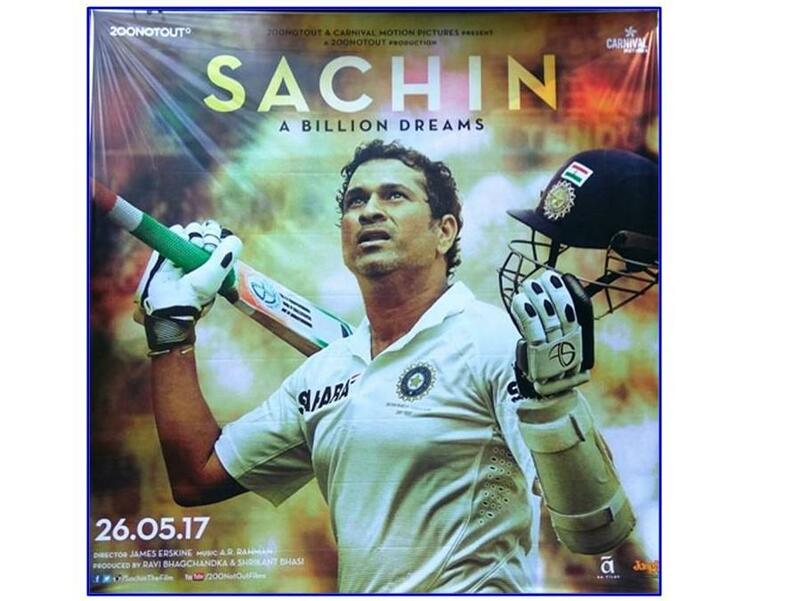 This article is first-hand review of the film Sachin: A Billion Dreams, which has been released in various languages. Most people, cricket fans or not, know about the debut of Sachin Tendulkar in the Test series against Pakistan & his bloodied nose during the fourth test, thanks to a deadly bouncer from Waqar Younis. That incident is there in his autobiographical film Sachin: A Billion Dreams, as are many other cricketing moments on the pitch that propelled the young boy to the status of a legend. Unfortunately, it is these cricketing moments which dominate the film, as also far too many tributes by other legends in the sport. It makes one feel that one is simply watching highlights of past matches and too much goody-goody stuff with controversies not finding place in the film. Nor is the supposed team camaraderie ever brought out. Yet, overall you do enjoy the film directed by James Erskine for good reasons because you do get glimpses of the man behind the legend. First is the insight into Sachin the prankster as a kid and getting to know his family – his parents, his brother Ajit who saw his potential as a batsman, his brother Nitin of whom he was always a little scared of, and his sister Savita, who made him ecstatic on giving him a bat from Kashmir. His coaching stint under Ramakant Achrekar at the Shivaji Park grounds is also well documented, including the challenge to bowlers to make Sachin out & rewarding Sachin with Re.1/- each time he played well at the nets. With the rewards he earned, Sachin would enjoy his all-time favourite local food – the wada-pav. Next is the cute (but not cloyingly sweet) and humourous narrative of when he first saw Anjali and her narration of having to tell his parents that they wished to get married instead of the other way round. When the video clips and wedding photos came on screen, there were a few claps from the theatre audience! One feels for her when she says she gave up her career to be a Paediatrician because Sachin said that one of them would have to take the decision & she allowed him follow his dreams rather than following her own. Then there is the interesting peek into his cricket kit, including his specially made gloves and the accessories of sandpaper, tapes and what-not. We get to see his children too, Sara and Arjun, both as kids and as teens, with scenes where he coaches his son at the nets. His love for cars and moments with friends on vacation are delved into briefly as well. It was also interesting to learn about his tactic to face the crafty spin of Australian Shane Warne. I wish more of this cricketing acumen had been brought out in the film, as it was in his book Playing it My Way which I read and enjoyed far more. In the book, that acumen is time and again to be marveled at, his keen eyes taking in the bowler's wrist movement and his brain already knowing where he wanted to hit the ball, having already observed the placement of the fielders. We come to know from the book his strategy in changing his batting stance to adjust to what he expected a particular bowler to do. As mentioned earlier, there is a lot of goody-goody stuff, but no controversy is touched upon. The "Monkeygate" scandal involving Harbhajan Singh and Andrew Symonds, where Sachin defended his team mate; and the shock Sachin felt when accused of tampering with the seam of the ball during a Test match against South Africa, are not even touched upon. Then there were his views on the contentious DRS (Decision Review System). All is avoided. The film, after all, is on the man considered to be God! There was a group of children among the theatre audience. Each time the 'Sachin, Sachin….Sachin, Sachin' sing-song chant of the spectators resounded in the stadium on screen, the kids too joined in the chorus. As one promo before the film's release stated "The stadium is coming to the theatres". It did feel like one was watching from the stands! All in all, it was indeed enjoyable watching the legend's journey from his childhood days with his initial love for tennis (so much so he even sported a headband like his idol John McEnroe!) to the milestones he covered during his illustrious innings as a cricketer till retirement. It may not appeal to all, like the blockbuster Bahubali-2, but will definitely bring a lump to the throat of his zillion fans. As a biographical documentary, it is overall enjoyable. Go watch it. Eager to buy and review the autobiography of Sachin Tendulkar, India's cricket legend? This article provides an insight into the book and where to purchase it online, as also details of its price. Review of Sachin Tendulkar's "Playing it My Way"
The Autobiography of Sachin Tendulkar had created a great hype in the media with the facts told by Sachin in the book. Have you ordered the book? Do you want to know how the book is? Check this review to get idea about how the book was. Will Sachin Tendulkar win the 2011 Laureus World Sportsman of the Year Award? Indian cricketing legend Sachin Tendulkar is likely to be one of the nominees for the 2011 Laureus World Sportsman of the Year Award, when the list of nominees is announced in January. This article gives you information about the 2011 Laureus World Sports Awards date, venue, categories, selection process, nominees & possible winners, and where to watch the 2011 Laureus World Sports Awards live. In this review, the autobiography of Sachin Tendulkar has been discussed. The review has furnished the pertinent details of the much-discussed book along with its salient features. It has discussed why should the book is an essential read not only for the fans of Tendulkar, but also for people from all walks of life. An objective review of the documentary-kind of movie. Nicely assessed and analyzed. Compliments.